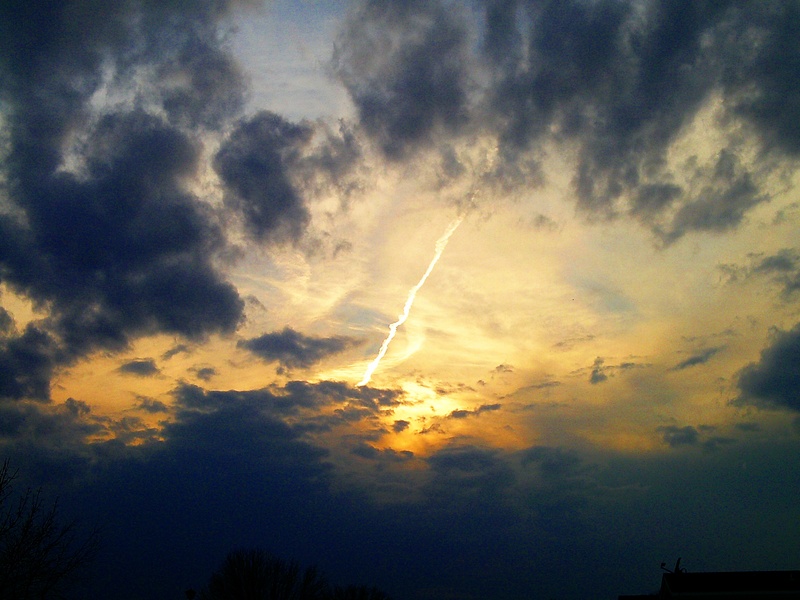 Oh, what a sight, the April sky of my dreams, found while walking home one evening. Those clouds are like dark smoke, fluffy, roaring, billowing out with the fierceness of giants. The streak of light pierces the evening sky, creating an electric connection between two cloud nodes, as if it communicating back and forth. But what became most surprising is when I stared at this long enough and the image of a demon god monster suddenly formed, holding the “lightning bolt” in a smoky grey hand, a scowl expression on his frowning face. An eye and a crown shaped head can easily be seen. The god, who might actually be Zeus, also seems to be sporting a large beard. It looks like he’s prodding the cloud below. And now I have just made out the image of a cannonball or bowling ball being lifted over the right shoulder of “Zeus” with a muscular arm and he apparently wanting to throw it – or it might be a large dark fist being raised in fury. His formless, ghostly body also materializes in the open space of the sky and it looks like he’s floating on his side through the channel. Now it is quite apparent: a thunderous god is in the clouds with his magic bolt or wand of lightning; I cannot look at this picture without seeing it now. Fiery orange, somber blue, wispy white, smog grey, amber yellow, all sifting together harmoniously to create this unimaginable scene. At the fiery core of the masterpiece is what looks like a volcano about to erupt. The eye of the storm. The sun simmering down on a calm April evening. This shot is absolutely beautiful. There is so much vibrant color, the rich shades of grey and deep blue tinged cumulus’ are marvelous. I cannot stop looking at the sky god, it is so amazingly clear now…it’s head is now fully shaped. I move in closer and wow – there’s an ear as well.